Avoid falling victim to BS by carefully considering (1) the source of information, (2) the information context, including the kinds of authority that are valued in different contexts, and (3) how delivery platforms affect you, and your information consumption psychology. Authority - Who is the author? What is their point of view? Purpose - Why was the source created? Who is the intended audience? Publication & format - Where was it published? In what medium? Relevance - How is it relevant to your research? What is its scope? Date of publication - When was it written? Has it been updated? Documentation - Did they cite their sources? Who did they cite? The Library's Fake News Guide is designed to help you distinguish real journalism from intentionally misleading information—such as hoaxes, propaganda, and disinformation—and to help you recognize editorials, satire, sponsored content, press releases and other varieties of content, that is often mistaken for journalism. 2. The Context: Whose Authority Matters? "There is an inequity in the way research is practiced in the world. Community knowledge and people’s direct experiences with day-to-day injustices get dismissed by decision makers. Yet, knowledge produced by mainstream institutions through scientific means is often seen as legitimate, regardless of whether it reflects the community’s truths and realities." Cultural & Spiritual Knowledge: Cultural practices and wisdom passed down from our community (i.e. elders, neighbors, family, friends, etc.). This knowledge is often shared through cultural and spiritual traditions (i.e. food, celebrations, ceremonies, etc.). Experiential Knowledge: Lived day-to-day experience; what we learn and know rom living and dealing with issues that impact our lives. Mainstream or Institutional Knowledge: Consists of published facts and data produced by research “professionals” usually from outside of the community (i.e. university publications, government documents, school textbooks, etc.). 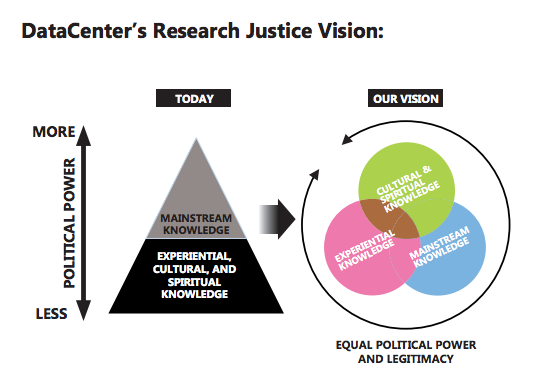 What balance of cultural/spiritual, experiential, and mainstream/institutional knowledge is appropriate for your research project? What kinds of knowledge do the sources that you are citing privilege? What kinds of knowledge do they ignore? Do the sources your professor wants you to cite fit into a specific sphere of knowledge? Are there spheres of knowledge they would prefer you ignore? What kinds of political power do the authors that you are citing have? Two other key components to consider in every information exchange: the delivery platform—whether it's Facebook or a library catalog—and the receiver of the information (e.g., you!). The following concepts and strategies will help you consider the pitfalls of our own information psychology, as well as the increasingly bold attempts of platforms and bad actors to game you. Attention - Platforms, companies, campaigns, and individuals (including hackers, trolls, and propagandists) spend considerable amounts of time and money to design information and systems that will attract and hold your attention. Strategy: Pay attention to your attention. If a particular headline attracts your attention, ask yourself whether or not it's worth your time before acting on impulse. Strategy: Exercise crap detection. If something seems fishy, google the topic to see if you can find any corroborating evidence from reliable sources, or google the author's name to see what else they write, who they work for, etc. Don't be tricked by sophisticated-sounding jargon or sophistry. Clickbait - Media organizations, including major mainstream news outlets, have significantly changed how they write headlines based on what gets the most clicks online. Some common elements of clickbait: lists, personal anecdotes, animals, food, pop culture, and/or shocking news (e.g., 7 Shocking Panda Encounters!). Strategy: Note the difference between entertainment and news. Clickbait can be highly entertaining, but it's rarely a reliable source for the truth. Confirmation bias - "The tendency to test one's beliefs or conjectures by seeking evidence that might confirm or verify them and to ignore evidence that might disconfirm or refute them" (via the Oxford Dictionary of Psychology). Strategy: Know thyself. We all have beliefs, values, and biases that come into play when we encounter different ideas. To ignore evidence that doesn't fit into your current worldview, however, undermines the possibility of meaningful growth. Consider both the source of information and your own reaction to it. Content farms - Websites that aggregate and churn out high volumes of low-quality information, in the interest of attracting page-views to sell ads. They often game search engines by way of black hat SEO or manipulate social media algorithms to distribute their links. Strategy: Note the quality and volume of ads on a website. A lot of obnoxious ads on a site, especially ads for dubious products, can be a good sign that the content of the site may also be questionable. ​Disinformation & misinformation - Intentionally misleading information, or disinformation, is often used by governments and political organizations to deceive portions of the population. Misinformation is a catch-all term for all false information, regardless of the author's intention. Strategy: Verify news stories in other sources. Seek out confirmation from journalists, research groups, or other trustworthy sources who are independently reporting on any given topic. See Data & Society's Lexicon of Lies for more on the vocabularies of misinformation. Echo chambers - A situation in which certain ideas or voices are amplified by virtue of a closed communication system. This occurs in the media when particular viewpoints are reported and republished without representing opposing viewpoints, and it's especially common in online communities where users can block or un-friend others who post content with which they disagree. Strategy: Cultivate a diverse media diet. Pay close attention to the media you consume and seek out other points of view on any given subject. Sites like allsides.com can help you diversify your political news intake, but it's also helpful to balance the kinds of sources you consult: seek out investigative reporting that digs into policy, for example, to balance the mainstream media's focus on political personalities and drama. Fake news - A category of disinformation popularized following the November 2016 presidential election, fake news initially referred to false content, usually outrageous stories, distributed on social media in order to make money from ads. The term was rapidly adopted by commentators and politicians to apply to "mainstream" and "left-wing" media sources. Strategy: Check out the Library Guide to Fake News. Filter bubble - A limited perspective that can develop when online platforms create personalized views of information based on your online behaviors, networks, purchases, and likes. By displaying content that the platform suspects you want to see, you may be less likely to encounter alternative viewpoints, leading to political or cultural isolation. Strategy 1: Game the platform. Interact with people in your network who may not share your viewpoints, don't hide "friends" with different politics than you have, and click on links to content you suspect you may not agree with. Strategy 2: Search and browse privately using Tor, Google, incognito mode and/or turn off your location history. Information cascades - Individuals are easily influenced by the stated beliefs of others. As we begin to conform our own behavior and beliefs to those of a perceived crowd, certain false messages can be amplified and begin to "cascade." False information takes on a sheen of reliability as more individuals share it online, regardless of its actual value. Strategy: Beware of scrolling. The next time you find yourself scrolling through a long newsfeed of content without engaging, take a break. Casually consuming information undermines critical thinking and can leave you susceptible to misinformation. Memes - Internet memes are often platforms for wrongly-attributed quotes. See, for example, the supposed Gandhi quote that both Donald Trump and Bernie Sanders posted to social media: "First they ignore you, then they laugh at you, then they fight you, then you win” (Snopes). Strategy: Google the quote before sharing! Most false quotes have been researched long ago on sites like Snopes, but continue to spread on social media since they're so easy to share. Do everyone a favor and make sure what you're sharing is real! Strategy: Know which section of the "newspaper" you're reading. News websites can obscure the context of specific articles, but the onus is on you to examine online content carefully to make sure you're not citing a subtly placed advertisement. Looking closely at the section a piece appears in can also help you to distinguish opinion articles from factual reporting. Sock puppets and Twitterbots - As early as 2014, Twitter noted that as many as 23 million of its users, 8.5% of the total, were automated accounts, or bots (via Quartz). Many governments (including the United States), have been found to use fake online identities, sometimes called sock puppets, to spread propaganda and disinformation. Strategy: Don't react to content from unfamiliar sources. Before you like, comment on, or share a social media post, take a moment to find out more information about the original poster of the content. Can you find any evidence that they're a reliable source? Are they a real person? Trust - When an article is posted to Facebook under the name and photo of a Facebook friend, your trust (or distrust) for the individual who posted the content may confuse your evaluation of the source itself. Strategy: Don't shoot the messenger. Keep in mind that an individual sharing content online may not have any particular expertise on the topic, or be in a good position to vouch for the quality of the information they are sharing. Try to separate your evaluation of the source from your feelings for the individual who posted it.